We believe in doing well by doing good, and embrace sustainable business practices. What is good food and why is it important? Transparency - Where do the source of ingredients come from and can they be be verified by a third party? Many of our premium and raw diets show that ingredients come from identifiable growers and producers. Just ask us if you have questions about a specific food or company and we will get the answer for you! Fair Labor Conditions- Labor conditions should meet, if not exceed basic standards. We work with a number of producers who are working to maintain ethical production. Simple, Wholesome Ingredients - The product is free from ingredients requiring intensive commercial processing such as preservatives and stabilizers. Sustainability - Ingredients can be USDA or Oregon Tilth organic standards, but many of our foods are added based on additional considerations that protect the environment. Certfied Humane is an important marked for many of our meat products, as an example. Non-GMO Ingredents - Non-GMO means non-genetically modified organisms. GMOs (genetically modified organisms), are novel organisms created in a laboratory using genetic modification/engineering techniques. Scientists and consumer and environmental groups have cited many health and environmental risks with foods containing GMOs. Local - When products are manufactured, grown and sold locally, our customers see the direct benefit of supporting their neighbors. These products are supporting their local economies, reducing transportation impact and increasing accountability. Local independent businesses are the backbone of our economy. They are better positioned to respond to the needs of our community and are inherently tied to the future of Washington, D.C. Local businesses also make daily decisions that address issues of economic, environmental, racial, and social equity. 14 jobs are created for every $10M spent on Amazon while 57 jobs are created for the same amount spent locally. These are just a few of the many positive things that happen when you shop locally. Small independent businesses also provide diversity and prosperity in their neighborhoods. At The Big Bad Woof, we work closely with other businesses, schools and non-profits to create internships, entry-level jobs and community building. The Big Bad Woof is a DC Benefit Corporation, which is a new type of business based on the 3 P's, People, Planet and Profit. That means that we made a concious decistion to have a "material, positive impact on society and the environment, taken as a whole, as assessed against a third- party standard, from the business and operations of a benefit corporation". As part of that mission, we place great emphasis on supporting local makers and producers to help directly impact our local and regional economy, reduce transport costs and build communities that care. 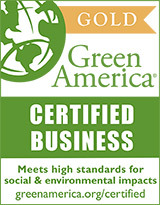 Our third-party sustainability reports are provided by Green America, and we have been a Certified Gold Member of Green America for a number of years. Pennye Jones-Napier (Co-Owner of The Woof) is also on the Executve Board of Think Local First DC, and is active and committed to building our local economy with other stakeholders in the DC Metro area. For more on Building Local Properity, see this video from BALLE. We are not sure why businesses don't realize how much they can save by making small incremental changes that can have a BIG impact on reducing their carbon footprint. At The Big Bad Woof, it is built into our corporate DNA to Reduce, Re-Use and Recycle goods whenver possible. Wonder why your shipments and deliveries come in a re-used shipping box? It's our way of continuing the life-span of those boxes and keeping them out of the landfills. What do we do with all if the plastic wrapping from our pallets and cases of food? Zeigler Distribution takes it all back to their warehouse for re-cycling! When Hungry Harvest delivers local fruits and vegetables for pick-up at our store, and you return those boxes, we re-use them for our own out-going deliveries. From the use of cloth hand towels tin our bathroom, to non-toxic cleaning products, to micro-fiber towels we evaluate the benefits of 'going green' and think they far outstrip any additional marginal cost and for the most part, all these actions save us mony and time. As an addition, we have solar panels coming this fall to our flagship store in Takoma DC! A special thank you to our landlords for looking at a bright green future! We know you have chosen a small, independent pet supply store because you want only the very best. Whether you live with a companion or service animal, The Big Bad Woof understands your needs and is on hand to answer your questions, help you adopt, and even deliver your goods to you! Located in the Takoma neighborhood of Washington, D.C., The Big Bad Woof is a retail store and community resource for companion animals and their guardians. The Woof provides access to organic, premium, and raw diets, and a wide range of holistic supplements for companion animals. We realize how important it is to pet guardians that they have essential pet supplies that are good for their animal’s health and well-being everywhere that they may go. Need a local delivery? Ordering is easy, just pick out your items, then complete the checkout process. The BBWoof Delivery Team will assemble your order, and bring it to your home, work or to one of our local Woof Pantries for free pick-up! By the way, our deliveries always include special treats for our customers! For the past 12 years, The Woof has maintained a strong commitment to its community. Through healthy relationships with local farmers, as well as the various local rescue organizations, fundraising events, adoptions and, specialized clinics and pet supply and food drives, the Woof has offered everyone the opportunity to be a better pet owner.